Going green has never been this easy or cost effective -- thanks to Green Power Energy! Cash purchase, anticipating system will supply 100% of electrical needs and approx 16MWh per year at $225 per SREC. System looks great, lots of interest and good will from neighbors. Helps protect my new roof from the sun! In prior years we've made a number of energy efficiency upgrades to our home including all new energy efficient appliances, new double pane Low-E skylights (2017). New high R-value garage doors (2015). New triple pane Pella windows and front door, and new triple pane bay window (2013). NJ Home Performance with ENERGY STAR upgrades -- air sealing / re-insulation (2010). Hoping to replace the HVAC in a few years it's original to the house and uses a lot of electric. Reducing energy costs, benefiting the environment, teaching my kids and neighbors about solar energy, making money (NJ SREC's). Definitely go with a SolarEdge system and choose Green Power Energy for your all of your solar needs in NJ and the surrounding area. All I can say is, “Wow!” It’s very rare that you find a vendor who is responsive, informative, flexible, reliable, AND cost effective. But Tim, Mike, David and the install team at Green Power Energy knocked it out of the park. 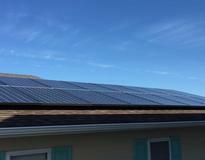 I needed a new roof and wanted a fairly large (12.2kW) residential system. When the dimensions of my roof came up a bit short for my needs, Tim came back with variety of options to maximize the productivity of my system and squeeze as many panels possible of my roof. GPE coordinated everything, roofing, permitting, inspections, and (of course) all of the installation work including the new SolarEdge consumption monitoring capability. I’m so happy with my new Panasonic panels and the monitoring data and enhanced performance I get from my SolarEdge solution. What a great company to work with! I sailed through my inspections the first time without any issues, and all of the installation work is top notch. I highly recommend them! Now's a great time to go solar in NJ.